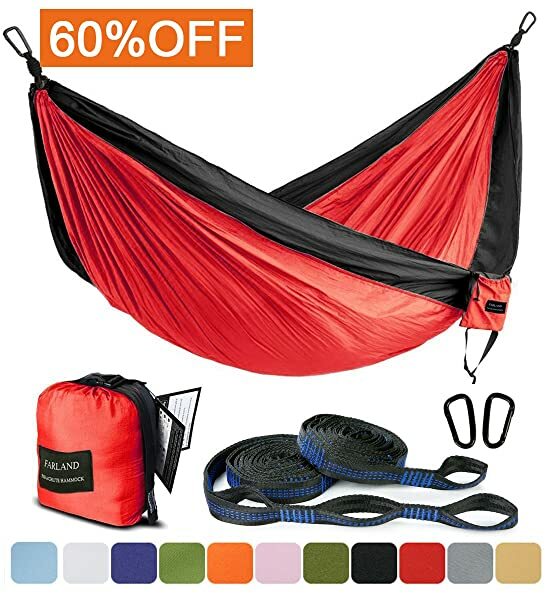 The bright and beautiful color combinations are the first element that will draw your attention when you get the SEGMART camping hammock from the small bag. This little bag also accommodates all the gear. The ultra-light and sturdy carabiners will also impress most users, but there is still more to the hammock than this. It is made from a durable 210T parachute nylon material. The adjustable straps make hammock height adjustment easy to ensure maximum comfort. It can withstand up to an impressive 600 pounds hence making it ideal for sharing. The carabiners are ultra light for easy portability but still very sturdy and safe. You can choose from close to a dozen beautiful color combinations. The compact and lightweight construction make it easy to pack up and set up. This hammock is easy to clean, and it also dries quickly. It is a versatile product that you can also use for various other things including as swing chair, sunshade and blanket. All the gear comes in one small bag for convenient storage and easy portability. There are a few complaints about the hammock developing some tears after a few months. The straps would be even better with some extra length. It will not impress you if you do not like hammocks that wrap you up. The bright and beautiful color combinations are the first element that will draw your attention when you get the SEGMART camping hammock from the small bag. This little bag also accommodates all the gear. The ultra-light and sturdy carabiners will also impress most users, but there is still more to the hammock than this. It also features some adjustable straps with 18 loops, and it can withstand up to 600 pounds. The hammock is 2 by 3 meters but only weighs about 2.2 lbs. 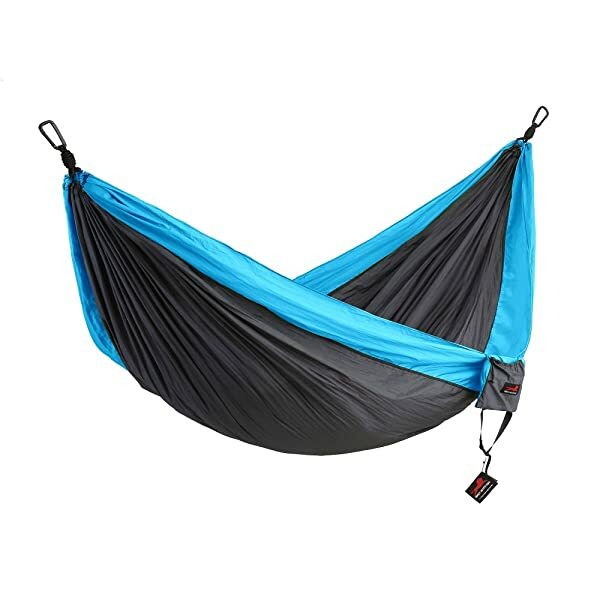 Material: It is a 210T parachute nylon hammock, and so you can be confident that you are buying a firm and durable product that you will use for a long time. 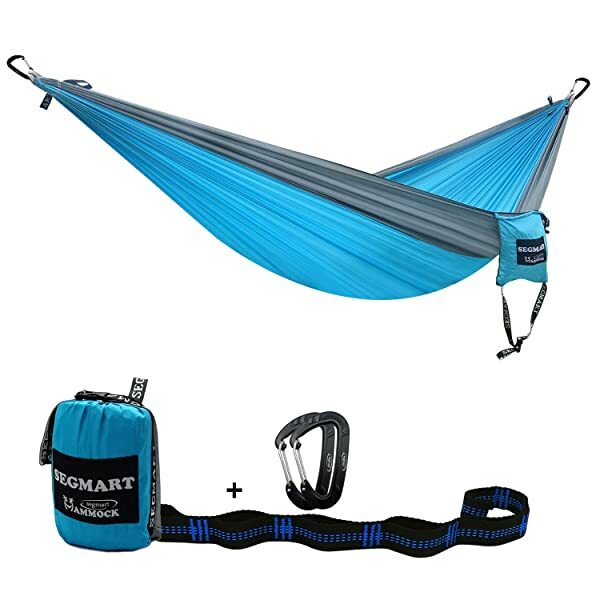 Adjustable Straps: SEGMART uses an 18 loops design that will make it easy for users to adjust the height of their hammock quickly to ensure you always get maximum comfort. 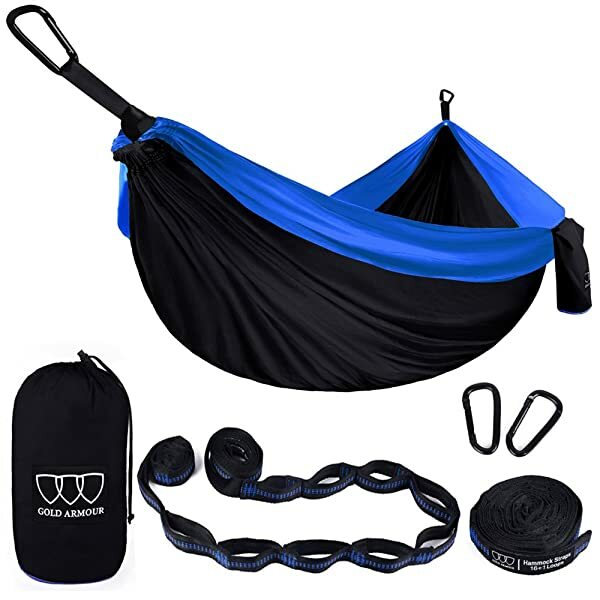 Ultra Light Carabiners: The carabiners that you get with this hammock are from a durable aviation grade aluminum alloy that makes them ultra light but still very sturdy and safe. Capacity: It can withstand between 400 and 600 pounds hence making it suitable for two sharing adults. Size and Weight: The size of the hammock is approximately 3 by 2 meters, and it weighs about 2.2 pounds only. Colors: You get to pick from close to a dozen color combinations that include blue/silver, orange/silver, and purple/red. SEGMART makes this double hammock for individuals that want something versatile that they can use for a variety of outdoor activities from camping out in the woods to relaxing in the backyard. It uses high-quality parachute nylon material, and so you can be sure that it will last for many years. But what most users will like is the fact that it comes with some adjustable tree straps and that it can withstand up 600 pounds. Even with the few shortcomings such as the straps not being long enough for some users, it is still an excellent product. 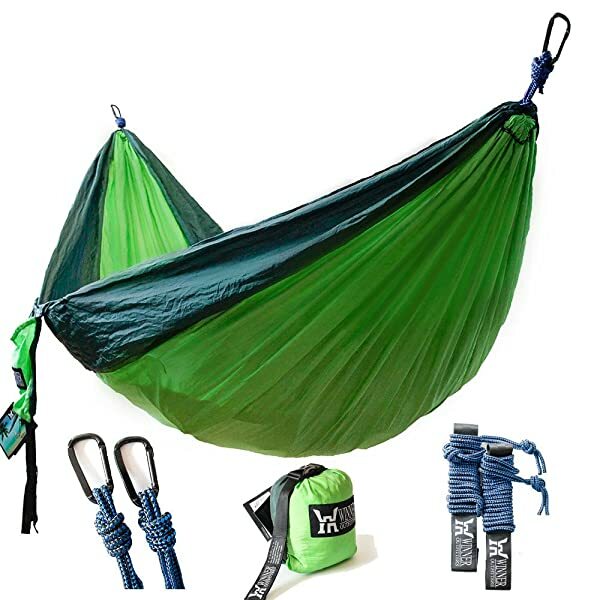 If you are on the search for a durable, affordable and portable hammock that you can use for camping, backpacking or hiking this one from SEGMART will be an excellent choice.